Tsvangirai Campaign Caves to Violence, Unrest Zimbabwean opposition leader Morgan Tsvangirai has ended his hopes to become the country's next leader. Just days before a special runoff election, Tsvangirai cited fatal intimidation tactics allegedly by supporters of his opponent, incumbent President Robert Mugabe. Zimbabwe freelance reporter Jeffrey Barbee explains the recent developments. Less than a week before Zimbabwe's presidential runoff election, opposition leader Morgan Tsvangirai announced yesterday that he is pulling out of the race. In his announcement, Tsvangirai suggested a continuation of his campaign could become too costly to the well being of his supporters. In recent months, armed militias and government forces backing incumbent President Robert Mugabe have waged a vicious campaign of intimidation against Tsvangirai supporters, resulting in dozens of murders. An earlier runoff election, scheduled for last week, was postponed due to violence. The development is the latest twist in a tumultuous campaign season that continues to gain worldwide attention. Although Tsvangirai emerged with a majority of votes in the March presidential elections, the margin of his win was not significant enough to clinch the nation's top office, according to officials. Jeffrey Barbee, a freelance reporter in Zimbabwe, explains the recent developments. Zimbabwe's opposition leader has withdrawn from the country's presidential runoff election. Morgan Tsvangirai of the Movement for Democratic Change says he is willing to negotiate with the government, but he blames President Robert Mugabe and his ruling party for creating a "violent, illegitimate sham of an election process." He says he is stepping down because the loss of life among his supporters is too high a price to pay. "[Mugabe] has already declared that he will not accept the opposition victory, he is not going to hand over power, and that he is going to go to war if he lost. So, under those circumstances, Mugabe is determined that he wants to stay in power forever and ever," Tsvangirai tells NPR's Renee Montagne. He says he'll move formally Wednesday to withdraw his candidacy in Friday's runoff election. Meantime, he reportedly took refuge Monday in the Dutch Embassy in Harare but had not requested asylum. Tsvangirai's withdrawal moved the head of the Southern African Development Community to challenge Mugabe and the legitimacy of the election. 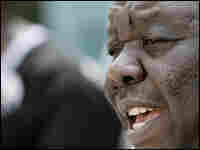 Tsvangirai says he was gratified by the SADC president's expression of disgust at Mugabe's intolerance. "My assessment is that if there is a collective position by all SADC leaders, that will be sufficient pressure" to ensure that the election is postponed and conducted according to SADC standards, or that Mugabe will be forced to concede, Tsvangirai says. Tsvangirai is calling for a United Nations resolution to investigate abuses in Zimbabwe, to declare the election void and to reconvene a first round of the election under international supervision. The U.S. and Britain have said they plan to bring Zimbabwe's crisis before the U.N. Security Council.